Reputation Marketing | Auto Body Shop Internet Marketing | cPrax Internet Marketing whose potential customers research online, which today, is virtually any shop. Why? According to a 2016 survey by BrightLocal, 84 percent of consumers trust authentic online reviews as much as they trust a personal recommendation.The survey found that while restaurants and cafes are the most common kinds of reviews respondents read, auto services was named as a key industry in which reviews are important to consumers, and 26 percent of respondents said they usually read auto service reviews before making a purchase. With almost any information we want at our fingertips 24/7, it’s not surprising that the same survey shows that most people look at reviews of a business or product online before they make a purchase.Online reputation matters! As a business, it should be important to maintain your reputation and make adjustments when necessary.When asked for which kinds of businesses reviews mattered most, auto services came in fourth out of 26 categories, with 36 percent of consumers stating that auto services was the kind of local business in which reputation mattered most. It ranked higher than hair and beauty salons, builders/roofers, and attorneys.Wanting to read reviews is understandable. Why would we, as consumers, trust a brand we don’t know anything about when its competitors have customers happy enough to take time to write about it on the internet? According to WebRepublic, 20-30 percent of online company reviews are fake. Although most consumers trust online reviews, they are aware of fake reviews or purchased reviews intended to make a company look better than it is. The same survey stated that if a company has no negative reviews, 30 percent of consumers assume the company’s online reviews have been faked.It has been shown that consumers read online reviews, especially in the automotive services industry, online reviews influence consumers purchasing habits, and that consumers mistrust reviews that seem inauthentic.So, when you’re working on gathering reviews, it’s important to make sure that you’re not asking for positive reviews, but reviews in general. The BrightLocal survey also found that of those who read reviews, the most important review factors are the overall star rating and the sentiment of the reviews, closely followed by the recency and quantity of reviews. This shows your potential consumers do care that you’re consistently gathering more and more reviews the longer you’re in business.In fact, 73 percent of consumers said that reviews older than three months are irrelevant.When gathering reviews is a priority in your business, it can be incorporated into your employee workflow. The most important thing is to make it easy for customers to leave reviews! The 2016 BrightLocal survey stated that 59 percent of people look at 2-3 review sites before making a decision, while 20 percent only look at one site. Where you ask for reviews is up to you, but remember that your website is not the only place people will look.Consider listings on Google, Yelp, Bing, or Yellow Pages, especially as automotive service businesses like auto repair shops serve mostly local customers, and these sites are commonly used for location based searches. How can you collect enough reviews to make a difference? The BrightLocal survey stated that 68 percent of consumers form an opinion about a business based on 1-6 reviews, and 90 percent have an opinion after 10 reviews or less.If reviews are considered irrelevant after about three months, you should aim to have 10 reviews every three months per review site. The more recent, authentic reviews you have, the better your online reputation will be. Our top suggestion - Get personal! Hands down, the best way to get customers to leave online reviews is by asking them in person. Based on our testing, we’ve found that the number one most effective strategy to get great reviews is face to face. Here is what we suggest our Partner shops do:When your customer is picking up the vehicle after a repair, have the appraiser, owner, or manager go over to the vehicle with the customer. When handing over the key, make eye contact and say the following:“We’re very grateful for your business and would appreciate it if you’d take a minute and leave us an honest online review.”Then, with their car key, hand the customer a business card with the URL for where to leave the review. We create a special page on the Partner shop’s website that makes it fast and easy for the customer to leave a review, and also share it on Google, Yelp and Facebook.Full disclosure;probably less than 10% of the shops we work with take the time to do this, however many of the repair shops who do practice this strategy have hundreds of online reviews, mostly 5 stars.The BrightLocal survey found that 50 percent of consumers stated that they have been asked to leave a review and did, while only 20 percent said they were asked, but did not leave a review. Although asking your clients in person is the preferred method, software solutions exist to automate many tasks - including collecting online reviews. They also have the added benefit of asking for an online review through email or by text message.There are any number of software solutions that will get the job done, at cPrax we offer our Partner shops a proprietary system designed for the auto service industry. Today’s consumer knows that any business is likely to screw up, and although negative reviews can turn them against you, reviews that aren’t negative can turn them against you too!According to the online review survey by Web Republic, 72 percent of consumers will consider buying a service with a 3-star rating, but only 27 percent will consider it with a 2-star rating. We don’t necessarily need a study to show that higher and more positive ratings are better, but that doesn’t mean negative reviews don’t happen!What you can do to manage negative reviews is make sure that you actually read the reviews your business gets and respond to both positive and negative reviews.This way, you’re seen as someone who cares what your customers think, even when something goes wrong, and potential customers are likely to trust you more. Why You Need More and Better Customer Reviews Where it Counts a.k.a. Reputation MarketingCustomer reviews are a key ranking signal as Google and other search engines strive to give the most relevant and useful results to their users. Local search and mobile search are now providing reviews and ratings high in results, making customer reviews even more important for ranking high enough for customers to find you.What ratings and reviews are customers seeing when they search online?Are you ranking high enough to even be seen?What have you done in 2015 to build a customer-winning five-star online presence?Local online and mobile search will heavily influence consumer buying in 2016 as more and more people rely on fast and easy search results to lead them exactly where they want to be to make the best purchase. The latest surveys show that over 90% of consumers are looking at online reviews to make better and more informed buying decisions. Are your future customers seeing a five-star reputation when they search online before spending their money? 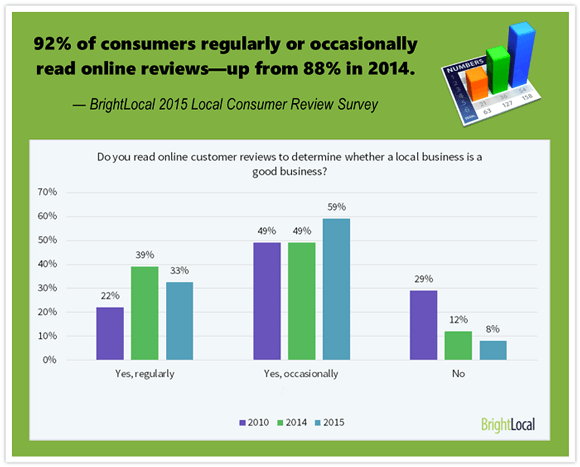 Here is what you should know from the BrightLocal 2015 Local Consumer Review Survey:- 92% of consumers now read online reviews (vs. 88% in 2014)- 40% of consumers form an opinion by reading just 1-3 reviews (vs. 29% in 2014)- Star rating is #1 factor used by consumers to judge a businessFor 2016 you need to do more to create a five-star reputation AND make that star rating as visible as possible online. Get more positive reviews and get them posted on the review sites and websites that your target groups use to find providers. Start by getting them on sites search engines and the local markets trust such Yelp, Google, and Yahoo Local.When you use a service like National Auto Body Reviews to handle your customer reviews and online reputation you’re able to utilize a widget that creates the eye-catching gold star ratings that show up in local search results so people see your overall star rating before they even search for reviews. Find out how National Auto Body Reviews can take all the hard work out of building and maintaining a five-star reputation that grows your business by visiting National Auto Body Reviews online. It is just amazing the speed at which world events are often sent around the Web via social media, and when that word is bad and happens to concern you or your company, you should have a plan of defense. If you've made an egregious error, there are ways to deal with that, short of getting into it with other people online defending yourself. You won't win, whether you're right or not. But what about when you're right? There are times when you'll generate negative buzz through no fault of your own. This can happen as a result of a dissatisfied customer, inaccurate press or misleading postings, or any number of ways. You've done nothing wrong, yet the social universe is abuzz with how bad you are! What now? Since we've identified that there isn't any good to come from fighting it out in a public forum, how do you keep from becoming a doormat in the eyes of public opinion? Be sure and stick to your core message! If you've got ample belief in your core message you will want to prove it by staying the course when others would try and put in their two cents. This opposition usually comes through social media as negative comments and complaints regarding your products, services, or particularly any changes you may have made. No one likes change, especially to things they enjoy or purchase. Then again, major time, thought and energy probably went into your new products or product changes. To roll with each and every whim of a capricious public is to welcome disaster. Make sure you answer every post though, using your characteristic diplomacy and customer care, but leave no doubt that you stand behind your products and services. One fine demonstration of a company enduring an onslaught of negative social comment is reported by SocialMediaToday.com. Shake Shack, a New York City eatery found itself in the deep fryer when it modified the shape of its french fries. Soon the Twittersphere was chirping negative, and the fight was on. ShakeShack, to their credit however, responded by staying on message, and defending the change, while bothering to answer each objection carefully. When you're right, sometimes it is possible to stand up for yourself. Just make sure you're right! Everyone's got an opinion, and unfortunately as a small business owner some of those opinions can cause your business a lot of trouble. Managing your online reputation is a big must-do item on your daily checklist. Forget to do it, and you might find people deserting you in hoards. Bad reviews are a reality of online life. They are really easy to post, and will often sway large segments of the target audience on your side or not. The trick is getting much more of the positive to outweigh the unavoidable negative. Here are three steps to proactively manage the occasional negative review. Make customer service a high priority - A big part of the reason companies find themselves in the position of needing to handle a negative online review is that often there is a failure within their customer service or support. Often times customers are reaching out through various channels, including email, Facebook, Twitter or in blog comments. Often they are ignored for way too long, leading to one mad customer, who feels like they have no recourse other than to vent their frustrations on an online review site. In actuality, much of the time the whole scenario could have been avoided by paying a bit more attention to your social and internal channels. Be professional at all times - The worst thing you should do is get in to an online shouting match with a client. This won't work out well for you, ever! Even if you're right, you're completely wrong to engage in this fashion, as it will scale this issue to heights you wouldn't think possible. Aim to remain professional, generous, and aim to keep that customer, or at a minimum make sure you don't lose more of them! Because this type of customer usually represents about 1% of your customer base, it's simply not worth the trouble it causes. Encourage good reviews - One of the better ways for you to actively really make a difference is by supporting and even rewarding positive reviews of your services or products. Get an adequate amount of these regularly, and the infrequent negative review will not stand a very good chance of remaining high in the search results. On the contrary, they will more than likely bring you more customers! Handling negative reviews isn't brain surgery, but it does call for diligence and professionalism. Today with the speed of communication online, you haven't any other choice! Consumers Trust in Online Reviews Skyrocketing! Myles Anderson of BrightLocal just released the 2013 Local Consumer Review Survey at SearchEngineLand. What is eye-catching within the study is that there are precise and undeniable results that we can see. Far more individuals are stating that they trust online reviews as much or more versus personal recommendations. A full 79 percent (up from 72 percent merely a year ago!) responded by saying online reviews carry the same importance if not more than a recommendation from people they know or trust. The trust in online reviews is building. A stunning 72 percent are of the opinion that genuine, positive customer reviews make them trust a business more. This is up from 58 percent in 2012! It's very apparent that buyers are looking and taking note more than before and are placing their trust in reviews. At the same time, just some 12 percent of consumers said they pay no attention of online reviews, down from 17 percent in 2012. Also, people are viewing far fewer reviews before making their buying decisions. Remarkably, 67 percent of consumers read 6 reviews or less, up from 52 percent in 2012. Consumers are also reading less than 7 reviews - 22 percent now vs. 35 percent in 2012. It's now more significant than ever before to successfully manage your online reputation. Because the number or reviews read are shrinking, and the impact of those reviews increased, it's crucial that you make sure you are monitoring your online reputation for all recent activity. As the newest reviews are swinging the buying decisions, you'll want to find out if anything negative shows up and act on it. Develop a policy for handling negative reviews in an open manner, and a system for generating new, positive reviews that will send those less than desirable reviews further down the page and out of sight. Ensure that these are genuine, as consumers are getting better and better at ferreting out fake and corporate-generated "reviews". This is the type of information that can make a big difference, both positively and negatively, for your business. Many thanks to Myles Anderson and the people at BrightLocal for this well-timed and enlightening study. We live in a world where communication is almost instant, word travels incredibly fast, and if you're not careful your online reputation can be trashed in nanoseconds. Many aren't aware of just how vital it is to protect your online reputation. Cone Communications reports that some 89 percent of consumers regard online channels are trustworthy sources, and that another 80 percent have gone so far as to change their mind about a purchase after looking at a negative comment or review. Further, your social media is where they're talking about you. The Society for Communications Research documents that 72 percent said they research companies through social channels prior to making purchases, and that 59% use social sites to air their frustrations about your customer service. Check your online reputation regularly - Google yourself and your company name at the very least once per month. Set up Google alerts to inform you if there are any mentions of your names or brand. Easy, free and necessary. Claim online real estate - If you don't own your company's domain name, or your personal one, make it a point to own these. A lot of damage can be done in your name otherwise. Be proactive on your social sites - Like your domain name, claim any Facebook, Google or LinkedIn pages that bear your name. Not only that, make it a point to use them regularly. Deal with any detrimental content quickly - Do your very best to take care of negative postings and complaints expeditiously. Try very hard to contact the poster directly, offline if at all possible, and see if you can handle their concerns. DON'T get in to a flaming match online. You'll be the loser. Be careful what you put online - Those lovely pictures of you and the staff partying hard are not exactly what you want to show up in a business context. We're all part of an instant information-driven world. Make certain you're in position to use this to effectively manage your online reputation! Think your online reputation doesn’t matter? Think again! Based on a study by Erik Qualman of Socialnomics.com, nearly three-quarters of respondents say they trust the information offered by total strangers online. Further, some 80 percent of consumers have changed their minds about buying a product after reading a negative review online, and over 84 percent say they find online product reviews as being a trustworthy source of information. You need to take negative reviews seriously and take measures to counter the negative effects! Look at your search results monthly – Monitor your company’s name in Google at the very least once a month. Use Google Alerts or mention.net to inform you if you have any activity involving your company name or important keywords. Also, look beyond page one of the search results;negative entries can gain traction and end up on the first page tomorrow. Deal with negative content ASAP – Do your best to make contact with the person who posted the content in question as quickly as possible, especially if they are an unsatisfied customer. Do your very best to take care of their concerns in a positive manner. Don’t enter into a public tussle with them! You won’t like the outcome. Use your company’s name in your page optimization – Be sure your pages and other content are using your company’s name in keywords, tags, URLS, and titles. The more pages you own that bear your company’s name, the better the possibility Google will view your site as the authority for this keyword (your company name) and provide you with higher rankings. Also, most negative content will most likely not have done any SEO. Ask your customers for reviews – The most apparent and by far by far the most useful tool for successful online reputation management is to ask your satisfied customers for a review. Encourage and even reward reviews. This is also your very best source of social proof! Follow these tips and safeguard your good name! It’s the right thing to do. Why Online Reputation Management is Important to Your BusinessThere is a lot of talk about online reputation management in board meetings these days. It seems that as soon as businesses jumped on the web and social media marketing wave, the Internet evolved into an even more complex organism, now requiring a deeper look into marketing in this ever-evolving world. It is no longer enough to establish your Internet presence. Now you have to manage it: you MUST protect your reputation. Why is online reputation management so important to your business? Here are the things you should know:The Statistics. Studies show that 90 percent of all consumers use the Internet research businesses when searching for services or products they are interested in. Regardless of the size and scope of your business, you simply cannot ignore that sector if you want your business to stay afloat. Even more, over 99 percent of Internet users never get past the first page of search engine results. They pay most attention to what they see at the top . . . and if you are not at the top, or if the top search results are not complimentary to your business, you are missing out – big time.The Web User Experience. Search for your business online. Also, search for your brand, product, and/or service. See what comes up. Considering the statistics above, now put yourself in a potential customer’s shoes. Do you like what you see? Is your web presence positive? Do you stand out in the crowd? Most importantly, would you choose your business over the competition, based on what you see? If the answer to any of those questions is no, then you need to pay some serious attention to managing your online reputation.The development of your online reputation. Your business WILL have an online reputation, whether or not you choose to manage it – plain and simple. The fact of the matter is this: if you do not choose to manage your online reputation, you can be sure that the public will. Some of that may be good, and some of it may be bad. Do you really want to leave such a major determinant of your business success (or lack thereof) in other peoples’ hands? Online reviews are important to any OEM Certified auto body shop whose potential customers research online, which today, is virtually any shop. Why? According to a 2016 survey by BrightLocal, 84 percent of consumers trust authentic online reviews as much as they trust a personal recommendation. The 2016 BrightLocal survey stated that 59 percent of people look at 2-3 review sites before making a decision, while 20 percent only look at one site. Where you ask for reviews is up to you, but remember that your website is not the only place people will look. Our top suggestion – Get personal! Full disclosure; probably less than 10% of the shops we work with take the time to do this, however many of the repair shops who do practice this strategy have hundreds of online reviews, mostly 5 stars. There are any number of software solutions that will get the job done, at cPrax we offer our Partner shops a proprietary system designed for the auto service industry. In our quest to satisfy our insatiable quest for more detailed data, it’s important to remember that we are dealing with real people who also have demands on their time. Knowing when and where that fine line exists for your most sensitive customer, and not crossing it, will serve you better in the long run than spreadsheets of CSI data and 5 Star reviews. It is just amazing the speed at which world events are often sent around the Web via social media, and when that word is bad and happens to concern you or your company, you should have a plan of defense. If you’ve made an egregious error, there are ways to deal with that, short of getting into it with other people online defending yourself. You won’t win, whether you’re right or not. But what about when you’re right? There are times when you’ll generate negative buzz through no fault of your own. This can happen as a result of a dissatisfied customer, inaccurate press or misleading postings, or any number of ways. You’ve done nothing wrong, yet the social universe is abuzz with how bad you are! What now? Since we’ve identified that there isn’t any good to come from fighting it out in a public forum, how do you keep from becoming a doormat in the eyes of public opinion? If you’ve got ample belief in your core message you will want to prove it by staying the course when others would try and put in their two cents. This opposition usually comes through social media as negative comments and complaints regarding your products, services, or particularly any changes you may have made. No one likes change, especially to things they enjoy or purchase. Then again, major time, thought and energy probably went into your new products or product changes. To roll with each and every whim of a capricious public is to welcome disaster. Make sure you answer every post though, using your characteristic diplomacy and customer care, but leave no doubt that you stand behind your products and services. One fine demonstration of a company enduring an onslaught of negative social comment is reported by SocialMediaToday.com. Shake Shack, a New York City eatery found itself in the deep fryer when it modified the shape of its french fries. Soon the Twittersphere was chirping negative, and the fight was on. ShakeShack, to their credit however, responded by staying on message, and defending the change, while bothering to answer each objection carefully. When you’re right, sometimes it is possible to stand up for yourself. Just make sure you’re right! Everyone’s got an opinion, and unfortunately as a small business owner some of those opinions can cause your business a lot of trouble. Managing your online reputation is a big must-do item on your daily checklist. Forget to do it, and you might find people deserting you in hoards. Bad reviews are a reality of online life. They are really easy to post, and will often sway large segments of the target audience on your side or not. The trick is getting much more of the positive to outweigh the unavoidable negative. Make customer service a high priority – A big part of the reason companies find themselves in the position of needing to handle a negative online review is that often there is a failure within their customer service or support. Often times customers are reaching out through various channels, including email, Facebook, Twitter or in blog comments. Often they are ignored for way too long, leading to one mad customer, who feels like they have no recourse other than to vent their frustrations on an online review site. In actuality, much of the time the whole scenario could have been avoided by paying a bit more attention to your social and internal channels. Be professional at all times – The worst thing you should do is get in to an online shouting match with a client. This won’t work out well for you, ever! Even if you’re right, you’re completely wrong to engage in this fashion, as it will scale this issue to heights you wouldn’t think possible. Aim to remain professional, generous, and aim to keep that customer, or at a minimum make sure you don’t lose more of them! Because this type of customer usually represents about 1% of your customer base, it’s simply not worth the trouble it causes. Encourage good reviews – One of the better ways for you to actively really make a difference is by supporting and even rewarding positive reviews of your services or products. Get an adequate amount of these regularly, and the infrequent negative review will not stand a very good chance of remaining high in the search results. On the contrary, they will more than likely bring you more customers! Handling negative reviews isn’t brain surgery, but it does call for diligence and professionalism. Today with the speed of communication online, you haven’t any other choice! The trust in online reviews is building. A stunning 72 percent are of the opinion that genuine, positive customer reviews make them trust a business more. This is up from 58 percent in 2012! It’s very apparent that buyers are looking and taking note more than before and are placing their trust in reviews. At the same time, just some 12 percent of consumers said they pay no attention of online reviews, down from 17 percent in 2012. Also, people are viewing far fewer reviews before making their buying decisions. Remarkably, 67 percent of consumers read 6 reviews or less, up from 52 percent in 2012. Consumers are also reading less than 7 reviews – 22 percent now vs. 35 percent in 2012. It’s now more significant than ever before to successfully manage your online reputation. Because the number or reviews read are shrinking, and the impact of those reviews increased, it’s crucial that you make sure you are monitoring your online reputation for all recent activity. As the newest reviews are swinging the buying decisions, you’ll want to find out if anything negative shows up and act on it. Develop a policy for handling negative reviews in an open manner, and a system for generating new, positive reviews that will send those less than desirable reviews further down the page and out of sight. Ensure that these are genuine, as consumers are getting better and better at ferreting out fake and corporate-generated “reviews”. We live in a world where communication is almost instant, word travels incredibly fast, and if you’re not careful your online reputation can be trashed in nanoseconds. Many aren’t aware of just how vital it is to protect your online reputation. Cone Communications reports that some 89 percent of consumers regard online channels are trustworthy sources, and that another 80 percent have gone so far as to change their mind about a purchase after looking at a negative comment or review. Further, your social media is where they’re talking about you. The Society for Communications Research documents that 72 percent said they research companies through social channels prior to making purchases, and that 59% use social sites to air their frustrations about your customer service. Check your online reputation regularly – Google yourself and your company name at the very least once per month. Set up Google alerts to inform you if there are any mentions of your names or brand. Easy, free and necessary. Claim online real estate – If you don’t own your company’s domain name, or your personal one, make it a point to own these. A lot of damage can be done in your name otherwise. Be proactive on your social sites – Like your domain name, claim any Facebook, Google or LinkedIn pages that bear your name. Not only that, make it a point to use them regularly. Deal with any detrimental content quickly – Do your very best to take care of negative postings and complaints expeditiously. Try very hard to contact the poster directly, offline if at all possible, and see if you can handle their concerns. DON’T get in to a flaming match online. You’ll be the loser. We’re all part of an instant information-driven world. Make certain you’re in position to use this to effectively manage your online reputation! Look at your search results monthly – Monitor your company’s name in Google at the very least once a month. Use Google Alerts or mention.net to inform you if you have any activity involving your company name or important keywords. Also, look beyond page one of the search results; negative entries can gain traction and end up on the first page tomorrow. There is a lot of talk about online reputation management in board meetings these days. It seems that as soon as businesses jumped on the web and social media marketing wave, the Internet evolved into an even more complex organism, now requiring a deeper look into marketing in this ever-evolving world. It is no longer enough to establish your Internet presence. Now you have to manage it: you MUST protect your reputation. Why is online reputation management so important to your business? The Statistics. Studies show that 90 percent of all consumers use the Internet research businesses when searching for services or products they are interested in. Regardless of the size and scope of your business, you simply cannot ignore that sector if you want your business to stay afloat. Even more, over 99 percent of Internet users never get past the first page of search engine results. They pay most attention to what they see at the top . . . and if you are not at the top, or if the top search results are not complimentary to your business, you are missing out – big time. The Web User Experience. Search for your business online. Also, search for your brand, product, and/or service. See what comes up. Considering the statistics above, now put yourself in a potential customer’s shoes. Do you like what you see? Is your web presence positive? Do you stand out in the crowd? Most importantly, would you choose your business over the competition, based on what you see? If the answer to any of those questions is no, then you need to pay some serious attention to managing your online reputation. The development of your online reputation. Your business WILL have an online reputation, whether or not you choose to manage it – plain and simple. The fact of the matter is this: if you do not choose to manage your online reputation, you can be sure that the public will. Some of that may be good, and some of it may be bad. Do you really want to leave such a major determinant of your business success (or lack thereof) in other peoples’ hands?